Every affordable Omaha SEO company must stay up-to-date with the latest industry goings-on. Stern PR Marketing is no exception. “I just completed about 50+ hours of continuing search engine optimization education, so we can continue to supply our client base with the best Omaha search engine marketing services in town,” notes digital marketing consultant/owner Susan Stern. With Google’s Hummingbird update last summer, combined with Google’s webmaster rules and regulations for >>white hat SEO techniques, there is a vast amount of information to know. Stern PR keeps abreast of how to do outstanding Omaha SEO company services, and is committed to staying on top of it despite the ever-evolving search engine MACHINE. “We’re passionate about education, learning everything we need to know about SEO Omaha services for our clients’ success,” said Stern. A timely analogy. “The road to Olympic gold, per se, is to rank on the 1st page of Google. That’s the goal. Placement can often make or break a business. Sadly, for one industry, phone book advertising is in last place, becoming obsolete. Internet Marketing Omaha Is It – a major part of the marketing mix. So, our duty demands that we triumph. That we know everything about SEO and follow all the ethical rules along the way,” said Stern, who spearheads Omaha SEO company services for clients. We use many, many tools to examine and implement each client website, social media and online listings for the appropriate Title tags, meta description and keyword frequency with the ultimate goal of achieving 1st page Google rank. We analyze competitors and use fantastic Omaha SEO strategies that seem to work. Modesty is the best policy, right? We are not perfect, that’s for sure. But great news! We are perfectionists, committed to continuing education of search engine marketing. We facilitate client success now and in the future. Stern PR Marketing firm has earned a reputation for exceptional copywriter services Omaha, learn why>>. We write high quality content for aesthetics and search engine optimization. Few SEO Omaha Companies offer professional writing services. Period. They’re technical people. Strategic writing is the means to the end. Branding, right. Stern PR owner Susan Stern has specialized in Omaha Public Relations writing for 25+ years, based on a successful on-air background in broadcast journalism in Nebraska, DC and Virginia Beach. Writing for the ear, eyes and video. Stern PR is better. Few Omaha website design firms offer this service. They are technical only. It’s challenging to write website content for the search engines. It’s recommended each article or post be at least 500 characters. “I typically write using the least words, active verbs and expressive adjectives based on my background in broadcast news. I know how to pen a great website, release, bio. So, for internet marketing Omaha services, I was forced to learn how to write long-winded, according to the best SEO principles, i.e. not spammy,” said Stern. “Still, my clients appreciate my writing. I’m clever and creative. I work with the search engine protocol. Since opening our doors in 2004 – commencing with a mere blog formerly entitled “Marketer Muses” – we have evolved into one of the best Omaha SEO companies in the metro tapping into our exceptional copywriting services, ” notes Stern. Offline, Stern PR also offers traditional marketing with brevity and quick-wit for press releases, brochures, resume and cover, etc. We’re outside-the-box thinkers. 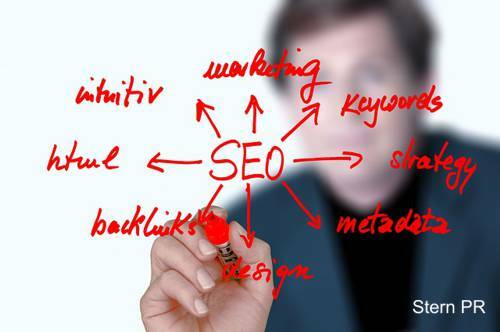 We offer a great degree of services beyond Omaha SEO Company work. We’re Omaha Neb web designers, copywriters and graphic designers in the Big O. We are a Video Production Omaha provider. Few if any advertising agencies, marketing or PR Firms in the heartland can boast offering ALL these full-services, in house. We do everything! Internet Marketing. Branding. Public Relations. Advertising. We’re Marketing & PR consultants. You name it! We do it. Clients seem to like that we offer personalized service. Call, text or email – you’ll get an answer right away. Stern PR is a small, yet highly creative AND effective marketing firm located in the big O! Our creative Omaha NE SEO company is available to serve your business. We care. We strongly believe that ‘if you succeed, we succeed’. We put early companies and established business on the map!